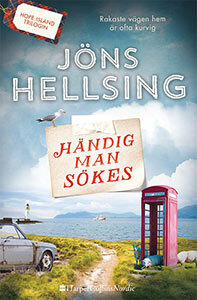 Jöns Hellsing is an absorbing storyteller from Sweden whose heart is divided between Sweden and Scotland, and Islay in particular, as Jöns renovated the old coast guard station overlooking Portnahaven. You probably know it as the wee square building on the hill above High Street. 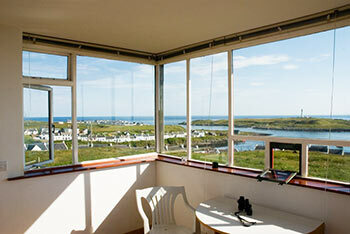 Nowadays it is run as a holiday accommodation, Four Winds, and it has some magnificent views. Over the last years Jöns has been working on an Islay inspired book which will be soon be published under the name "Hope Island Trilogy". The Hope Island Trilogy is not a story about real Islay people. It’s a 100% made up story on a fictive island called Eilean Dóchas ”somewhere off the west coast of Scotland”. As the book is Islay-inspired I asked Jöns to send me some more info about himself and his new book. My first visit to Islay was in 1992 when I came with my father Lennart – and was taken by storm. Many years and returns later, I had renovated the old coast guard station overlooking Portnahaven, today a holiday studio and a writer’s retreat. Inspired by Western Scotland and the Hebrides in general and by Islay and Portnahaven in particular, I have now completed the first volume of my planned Hope Island Trilogy. The book is called ”Handyman wanted” (”Händig man sökes”) and is a feelgood adventure about a young man finding his way home on winding roads. It’s set in 1985 when the iron-hard reforms of Margaret Thatcher divided the union and a 19 year old Samantha Fox was hot stuff on page 3 in The Sun. London August 1985. John is a 28 year old loafer with dreams of becoming an author. A job posting takes him from London to a tiny village on a Scottish island where a decayed cottage is to be renovated. A perfect setting for his writing - if it wasn't for a Swedish lady starving for love, an English lord with a desperate plan and Heather MacDonald, a 23 year old local pubowner who believes in miracles. "Handyman wanted" is a feelgood adventure about a young man finding his way home on winding roads. The book is the first part in the Hope Island Trilogy about Scottish islanders' fight for freedom and set in a time when Margaret Thatcher and Samantha Fox rule the union. The book is to be released in Sweden Monday 3rd April 2017 and later in Norway, Denmark and Finland. The book has not yet any UK publisher. Part of the manuscript – together with summaries of all the books in the Hope Island Trilogy – has been translated and is currently being read and evaluated in +10 countries ranging from UK and France to India and Japan.